Description: Slender twiner or trailer, stems ± glabrous, latex milky or watery. Leaves with lamina broad-lanceolate to ovate, 2.5–6 cm long, 1–3.5 cm wide, apex acuminate, base mostly cuneate or rounded, thin, both surfaces ± glabrous; petiole 7–20 mm long, sparsely hairy. 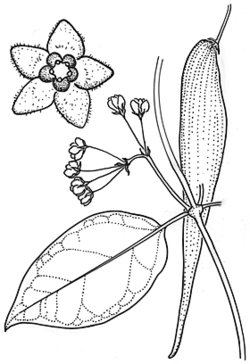 Flowers in 1 or 2 short umbels, each 3–5-flowered; primary peduncles 15–25 mm long; pedicels c. 10 mm long. Corolla 5–6 mm diam., purple-red; lobes spreading, 2–3 mm long, shortly hairy. Corona glabrous. Follicles slender, 5–7 cm long, rarely seen. Distribution and occurrence: Widespread, in rainforest and wet sclerophyll forest, south from Bulahdelah.